And yeah, do link our WonderBang Forum too. Also, if you wanna be linked, do leave a comment behind. State the following please. And yeah, Fam Bam, you can give me links to your own site, or your country’s forum. No worries! 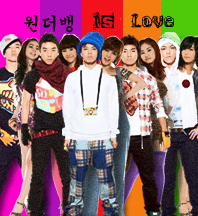 i love wonderbang ! ye eun-impact is definately supporting wonderbang! Any description needed: Big Bang Blog and other’s collaboration with BB. can i request you to chnage ye eun-impact banner url? Any description needed: fansite for dae sung lovers and vips. and thanks for linking back! Name of Site: Wonder Girls’ fanclub in Mongolia! @ YJ >> awww.. thanks for sharing!! ♥MiSoBinYe♥ >> Linked! And you’re welcome! Image: we might have an official one later, will you be able to change it when we do? Connie >> Linked! Of course I can change it! Just drop a comment again! can i be linked to your site? @ sunyelove >> hey!! sorry for the late reply!! You’ve been linked!! Any description needed: Be a KPop Stalker. If you accept this affiliation, inform us for putting the link to your site on our site, ok? @ sid >> help you with what?? If you have a website and you us to link your website from here, just use the above form. In return, you’ll have to link us (blog & forum) to your site as well. Do you have any website to link to from here? And it’s not your personal blog. Hello! I have a fan site Brazilian dedicated to CNBLUE and wanted me to join your site. It is a site dedicated to Asian music in general and news of singers and actors. Most everything turned to music.